WHAT IS A HATCH CHILE ROAST? Mollie Stone's is partnering with Melissa's Produce to bring authentic New Mexico Hatch Chiles to the Bay Area. Hatch Chiles are only harvested in August and September, so don't miss your chance to stockpile them! Join us at one of our upcoming Roasting Events to experience the amazing aroma as we roast these peppers for you in a large propane roaster. 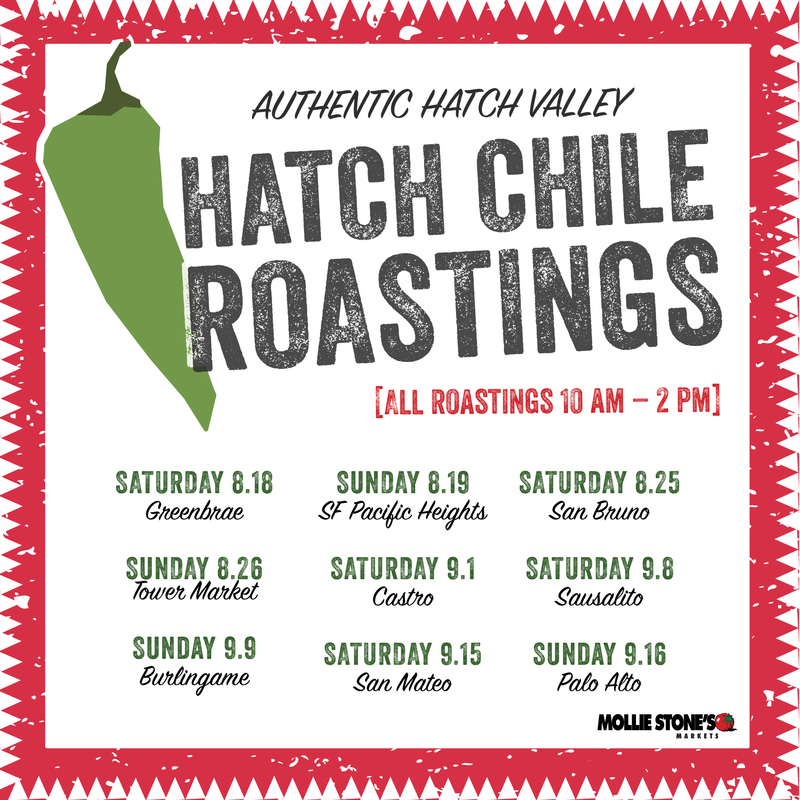 We will be hosting Roasting Events at each of Mollie Stone's locations during the Hatch Chile season. Our chefs will also be offering tastes of delicious Hatch Chile dishes through out the store. Look for the "Hatch Hunt" green and orange balloons around the store during the event to find these delicious samples! PRE-ORDER ROASTED HATCH CHILES FROM MOLLIE STONE'S HERE. WHAT MAKES HATCH CHILES SPECIAL? These truly unique, meaty green peppers only grow in the fertile soil of Hatch Valley, New Mexico. The nutrient-rich soil, intense sunlight and cool desert nights of the Hatch Valley give the chiles their one-of-a-kind taste. They are packed with earthy flavor and develop heat levels ranging from mild to extra hot. WHAT IS THE BEST WAY TO ENJOY HATCH CHILES? Hatch Chiles are traditionally bought in bulk, roasted immediately and frozen to use throughout the upcoming year. They are a staple in New Mexican cuisine and will add flavor to any recipe-burgers, tacos, pastas, casseroles, appetizers and even desserts like chocolate chip cookies. Mollie Stone's chefs will be preparing special recipes-look for our Hatch Chile Cornbread, housemade Hatch Chile Sausages, Hatch Chile Relleno and much more throughout the store! Share your Hatch Chile experience: #HATCHCHILEROAST!